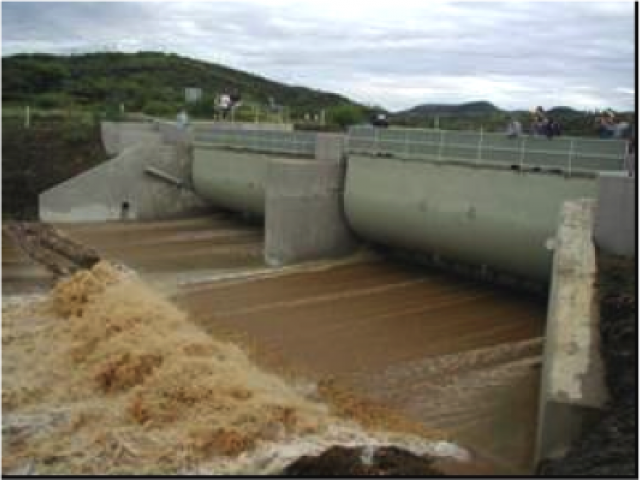 LCE was commissioned by the City of Windhoek to modify the existing spillway of Avis Dam on the eastern side of the city, in order to reduce the 1:100 year return period flood discharge from 500 m3/s to 360 m3/s, but to do so whilst ensuring that flood waters no longer spill over the original natural spillway. This was achieved by incorporating two, 10 m long and 3.5 m high TOPS gates into a new 5 m deep, 28.5 m wide spillway channel, which was formed by enlarging the existing natural spillway. The design and specification of these TOPS gates was carried out in conjunction with Flowgate Projects in Randburg, South Africa, who design TOPS gates for applications around the world. These patented TOPS gates are unique in that they offer a reliable, un-manned system, whereby the gates open and close automatically at pre-selected water levels, to control the flood discharge of a spillway. The project entailed geotechnical investigations, the detailed design of the spillway structure, the design of the spillway gates, as well as the installation and testing of the TOPS gates, and was carried out in conjunction with Flowgate Projects and Geo-Logic Solutions. Construction was completed in 2003.